A very particular story belongs to Namibian KBA league team named Osire Splash. This team is based in Osire Refugee Camp in central Namibia, situated 200 km north of the capital Windhoek. Established in 1992, the refugee population of Osire is now around 7.000 after having reached a peak of 20.000 in 1998 and the majority of current refugees came from Angola, and Democratic Republic of the Congo. In our opinion, Khomas Basketball League officials made a great decision to accept a team from that site, offering to the young guys displaced there a way to forget for some time their refugee status. 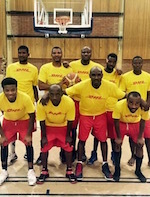 See here down the Osire Splash full team roster, made of players from many parts of Africa, with only one player from Namibia, forwad Istvan Oliver.